Considering your first RV rental? More and more people are experiencing their first RV trip these days. Fortunately, the web has taken a lot of the intimidation out of the idea with lots of tutorials and video walk-thrus. There is nothing to fear and renting an RV for a vacation experience, or even a business trip, can be easy and wonderful! Here we’ve gathered together some great learning resources for you to help you find where to rent and the basics you need to know about RVing. Keep reading to find out how to book your very own California Dreamin’ road trip. Be warned though, renting an RV for the first time can be a gateway into a whole new lifestyle! Camp-California works very closely with RV rental agencies in California to provide the Camper’s Guide to California in every rig. Our friends include Cruise America and El Monte RV as well as many private dealerships with their own rental fleets. See a contact list here. When you roll into a campground in a fleet wrapped rig, expect to receive warm greetings and offers of help from veteran RVers. Another distinct advantage of renting from a commercial fleet includes a host of upgrades to enhance your experience and the durability of the rig. Decades of renting to new RVers have delivered insight into the most valued features for the best experience. See this walk-thru provided by Cruise America. Also growing rapidly in popularity are platforms for renting an RV from a private owner. It’s going to be the most personalized customer service experience you can find, complete with tips on the unique features and personality of the vehicle you’re renting. There are many options of RV style to choose from, each with an availability schedule. There are even options for renting an RV already delivered to the site of your choice and set up – no driving required! It could take some research, but there are quite a few options for finding your match. And who knows? Before you know it you may even find yourself adopting the lifestyle and renting out your own new rig! 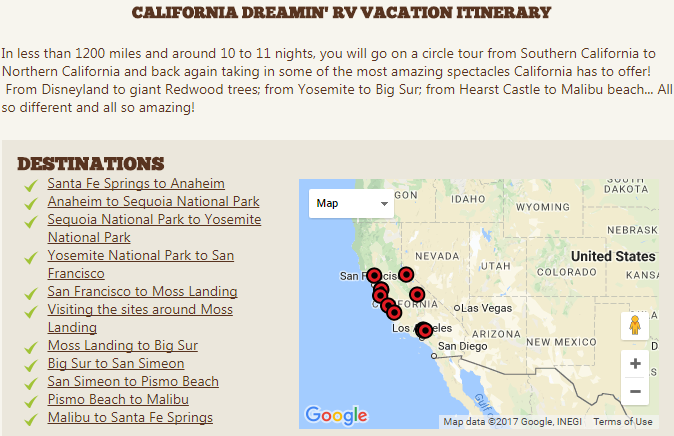 Take your own California Dreamin’ RV Road Trip!